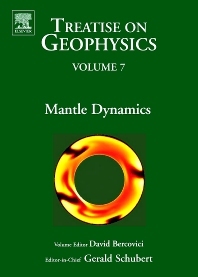 Treatise on Geophysics: Mantle Dynamics, Volume 7 aims to provide both a classical and state-of-the-art introduction to the methods and science of mantle dynamics, as well as survey leading order problems (both solved and unsolved) and current understanding of how the mantle works. It is organized around two themes: (1) how is mantle convection studied; and (2) what do we understand about mantle dynamics to date. The first four chapters are thus concerned with pedagogical reviews of the physics of mantle convection; laboratory studies of the fluid dynamics of convection relevant to the mantle; theoretical analysis of mantle dynamics; and numerical analysis and methods of mantle convection. The subsequent chapters concentrate on leading issues of mantle convection itself, which include the energy budget of the mantle; the upper mantle and lithosphere in and near the spreading center (mid-ocean ridge) environment; the dynamics of subducting slabs; hot spots, melting anomalies, and mantle plumes; and finally, geochemical mantle dynamics and mixing.